Discover the charm and comfort of lodging at The Creekside Bed & Breakfast nestled in the heart of the California wine country in Paso Robles, California. Tucked in among the moss covered oaks on Jack Creek, Creekside B&B is the perfect place for a relaxing vacation, romantic weekend getaway, honeymoon, or anniversary. Complete privacy and luxury accommodations embody our rustic, modern Inn. Creekside Bed and Breakfast features three attractive and charming suites with fireplaces and picturesque views of our beautiful countryside. In the morning, feel free to lounge in your Creekside bathrobe; your hosts will deliver a hot delicious breakfast to your door at the time you request. Designed with tranquility in mind this suite offers a cozy sitting area and plush fabrics to help you escape the hustle and bustle of everyday life. A private entrance, private front lawn with several outdoor sitting area's, private bath with king bed with luxurious linens, kitchenette with refrigerator, microwave, coffee maker, coffee grinder, teapot and asortment of tea's. Direct TV, complimentary wifi, private dining area, air conditioning, ceiling fans and secluded creekside views. Creekside B&B is near many of the Californian Central Coast's best known tourist sites - historical Hearst Castle, Morro Bay, and delectable farmers' markets of Templeton and Cambria. 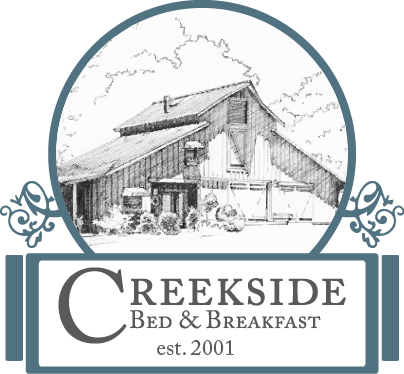 Creekside Bed and Breakfast welcomes you whether you seek to renew your sense of adventure or escape the maddening pace of everyday life. A museum unlike any other in the USA — and one that's not to be missed. Experience what life was like as a guest of W. R. Hearst and explore his personal collection of rare and ancient works of art. Encounter the majesty and beauty of this historical treasure first-hand with a guided Hearst Castle tour. Year round activities in this beautiful slice of California. From ocean-side golf, kayaking, sailing, hiking, fishing, surfing, biking, and bird watching, to kite flying, shopping, dining, wine bars, local craft brews and miles of unspoiled beaches, there is something for all ages to enjoy. Year round farmers markets boast the freshest seasonal produce, cheese varieties, locally raised meats, fresh seafood, olive oil, baked goods, etc. All products for sale have been homegrown or homemade, no re-selling is permitted. What a variety of delicious products you'll find!